Just Fitter has recently published a new blog post, discussing the benefits of consuming alkaline foods. The company is the manufacturer of numerous top rated Amazon products, including home testing strips for measuring the pH of the body. Just Fitter, a renowned manufacturer of health a wellness products, has just published an insightful article through their official blog. This brief article discusses how the human body benefits from the intake of foods that are alkaline in nature. The new blog post from Just Fitter starts by mentioning that all foods have either an acidifying or alkalizing impact on the human body, depending upon their mineral content. Under ideal circumstances, the body has a neutral pH of seven. Just Fitter mentions that a lower than seven or acidic pH is shown to be responsible for type 2 diabetes, heart related diseases, and obesity. On the contrary, regular consumption of alkaline food helps improve bone density, memory and cognitive level, and reduce pain and the risk of hypertension and stroke. · Avoid sourdough, tortillas, whole grains, white bread, brown rice, mayonnaise, ketchups, peanut butter, canned food, and sugar substitutes. 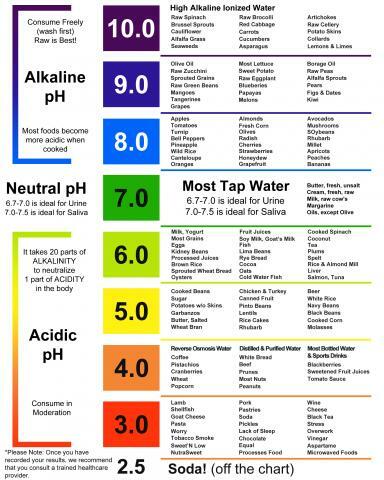 Maintaining an alkaline body requires regular and accurate measurement of the body pH. Without a clear idea about the body pH, it isn’t really easy to initiate the essential lifestyle changes. This is where pH testing strips can be extremely useful. Out of many different ways to measure the body pH, this is the most popular one because it is uncomplicated, inexpensive, and accurate. Just Fitter is the manufacturer of one of the most popular pH testing kits on Amazon.com. This product has been used by tens of thousands of Amazon shoppers to measure their body pH using saliva or urine. Each pack of the product contains one hundred and twenty five testing strips, and is currently available for $9.95 only. Just Fitter follows stringent manufacturing and quality policies for all their products. Each pack of the product comes with a shelf-life of two years. However, once the seal is broken, the testing strips retain their accuracy for 60-90 days. With seven hundred plus Amazon reviews to its credit, Just Fitter pH Testing Strips are amongst the top thirty bestsellers in the category of urinalysis strips. About Just Fitter: Founded in 2014, Just Fitter is dedicated to helping people achieve their best physical, mental, and spiritual health by encouraging them to embrace the benefits of a Keto diet lifestyle. Partnering with some of the best doctors, chemists, and nutrition scientists, the company has already helped thousands of people improve their lives in many ways including going Keto. Just Fitter also runs a popular Facebook page called createtheperfectyou, dedicated to helping people adopt the Keto lifestyle.